Super Bowl XIII, played in lovely Miami, Florida, once again featured two of America’s favorite teams, both past and present. 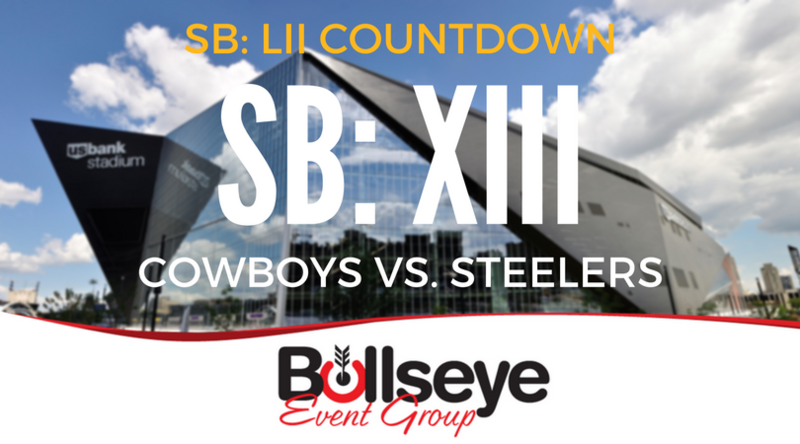 The Countdown to Super Bowl LII rolls on with the Dallas Cowboys (once again) facing off against the Pittsburgh Steelers. Two of America’s most iconic teams would take part in the thirteenth installment of the Super Bowl, slowly becoming the most popular championship event in the world. The Pittsburgh Steelers, winners of the AFC, would go up against back-to-back NFC champion and the defending Super Bowl champion Dallas Cowboys at the famed Orange Bowl in Miami, Florida. However, Super Bowl XIII would prove to be less enjoyable than the previous years for Dallas, as the Steelers would come away with the 35-31 victory in front of nearly 80,000 fans. Steelers quarterback Terry Bradshaw would be awarded the Super Bowl XIII MVP honors, completing 17 of his 30 passing attempts for 318 yards and four touchdowns, as the Steelers would never trail throughout the game. The final score of 35-31 was much closer than the game itself, as the Steelers actually led 35-17 with 19 seconds to go in the game. Super Bowl XIII would become infamously known as Black Sunday in Las Vegas, as many notable sportsbooks lost big on wagers throughout the game. Cost of commercials during the Super Bowl continued to rise in 1979, this year’s cost of a 30-second spot rising to over $185,000 per spot, by far the most expensive to date for a Super Bowl.The announcers for Super Bowl XII were none other than Curt Gowdy, Merlin Olsen, and John Brodie.